About 30,000 runners are entered in the 2018 Boston Marathon. In our analysis of the top 25 cities by number of runners, Boston leads with 749. While the gender mix across all 30,000 entrants is 55% men, 45% women, we were surprised to find the in Boston, 59% are women. 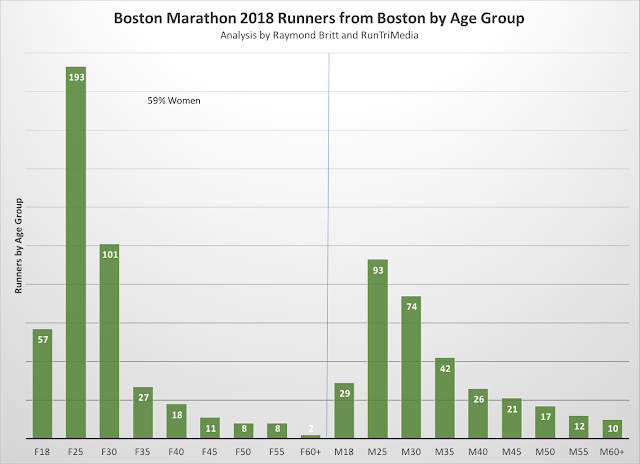 In fact, the Female 25-29 age group has twice as many entrants as any other age group in Boston. For more comprehensive coverage see www.RaceBoston.com.